Decking out your garden can completely refresh the look and experience of your outside space. Decking not only creates an area for sitting and sun worshipping, but it is also an incredible social place for a BBQ or summer dinner party and can create a striking structural centrepiece in your garden. We tend to start thinking about this as the first REAL sun comes out in spring and the weather starts gets warmer. So why not start to plan early? Now is the perfect time to start looking into a professional garden decking installation for Summer 2018! Decking can be easier to construct than patios, and wood is very versatile in creating the exact effect you imagined. Wooden decking is strong, reliable, and can mould into your garden, looking warm, natural and elegant. The first thing you will need to consider when planning your decking is where in your outdoor area it should be. A deck can really be built anywhere in your garden. Many people choose to extend their deck from their home, inserting patio doors so that they can simply walk out onto the decking. This can look very stylish and means that you can enjoy your garden with very little effort. A standalone decking can also look very striking and creates a focal point in your garden. Whether you want to place the decking in a corner, along one side or in a central position is entirely up to you: anything is possible! When planning your decking, consider where the sunlight falls on your garden throughout the day. If you’re looking for a sun trap then make note of where the warmest area of your garden is. On the other hand, you may want to take into account shade and create a decking with a cooler area for those hot summer months. If you intend to use your decking for entertaining, it’s important to situate it in an easy accessible, visible and central area so that guests can use it as a point for socialising. It is also a good idea to think about which areas of your garden provide the most beautiful views – after all, this is something you will experience on your decking every day. When designing your decking, it’s important to consider not only functionality, but also how it will contribute to the overall appearance of your garden. You will want to enhance the features your garden already has, and create a statement. Will you go for a classic, simple rectangle? This look will never go out of fashion, and is great for patio tables, barbeques and multi-purpose use. It creates clean lines in a garden and can look incredibly stylish. Or are you thinking of a more unique design, something to add a bit of interest to your space? Perhaps some steps, or multiple levels? Have you considered some sort of built-it lighting system? Anything can be achieved by our specialist decking installers, so whatever idea you have, we can make it happen! Think creatively, reflect your personality and work with what you’ve got and you will have a beautiful decking that will transform the appearance of your garden entirely. Which are the best materials for garden decking? 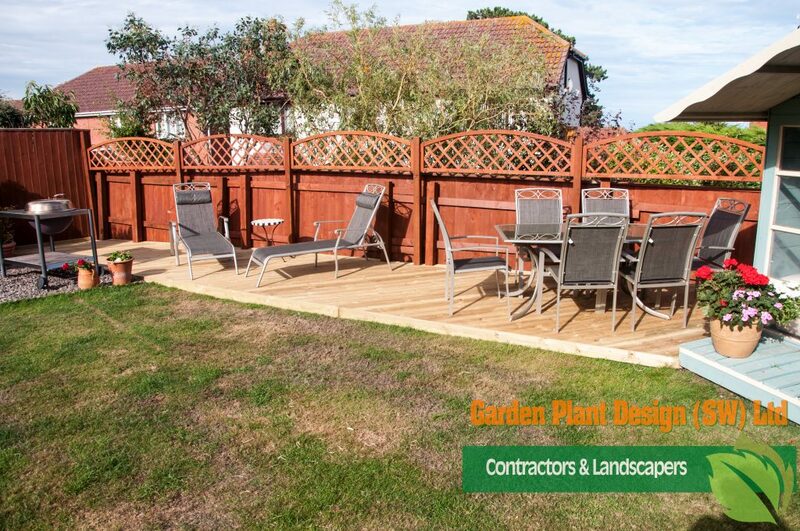 Our decking team at Garden Plant Design use highest quality materials that will withstand anything that our lovely British weather can throw at your decking. We can source any type of wood and fittings to create a truly unique finish that will perfectly complement your garden and tastes. There are many types of wood to choose from when building a decking. The two main categories are softwood and hardwood. Softwood is, as you might have guessed, softer, and comes from coniferous trees. This is a very popular choice, as it is available in a range of profiles, grooved, reeded, or flat, and it is also very cost-effective. 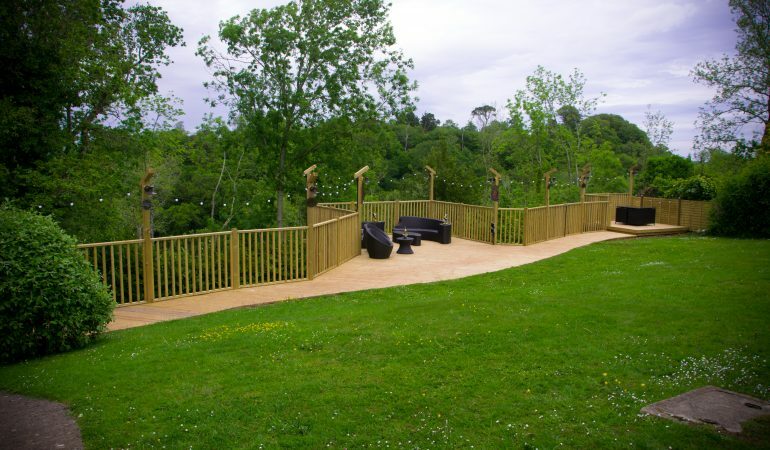 A softwood decking can last up to 25 years and is quick to install. Hardwood decking is made from timber of premium quality, harder and more resilient than softwood, but is also more expensive. Hardwood comes in a variety of gorgeous colours, which require more attention to maintain, but with the correct care it will last forever. Every different type of hardwood has unique characteristics and appearances, each of which are truly beautiful. You can choose from almost any type of wood to suit your garden. Our decking designers will guide you in picking out the materials to create a stunning finish. Contact our decking installers in Torbay and Exeter today for specialist advice! If you want us to transform the look of your garden, create and utilise a space for enjoying the sunshine for years to come, contact us today for a consultation to make your decking dreams become a reality!